“Clearing” is a broad topic and can be taken as intimately as clearing the body of a cold or something more serious, to our own relationships, to the things that encircle our communities, country, world and larger solar system that we care about and are affected by. For this installation, I solicited participation. It’s pretty simple: I asked people think about something, ideas, people, places or things they might like to clear. I collected this information by providing small envelopes and paper for them to write their thoughts on. 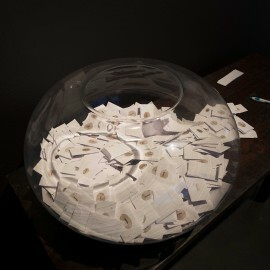 The envelopes were sealable and became part of the larger exhibition entitled “Clearing”. No one read what was written. Fixed to the envelope was the word “clearing” and a small piece of mica. 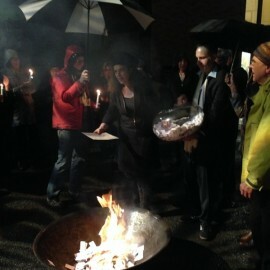 At the end of the show, on December 9, 2014 all of the collected envelopes were burned in ceremony with the intention of honoring everything everyone globally wishes to clear collectively. The remains are over 2500 small mica circles, as mica does not burn. These collected elements have been gathered in a jar to commemorate the experience. 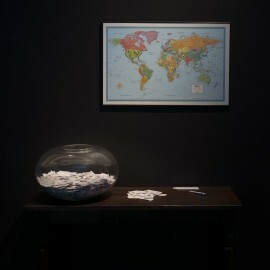 Participation was local, national, and stretched across the globe as far as West Africa, Afghanistan, Australia, Japan, Mexico, Iran, Brazil, Siberia, Germany and Canada to name a few locations.